Coffee, coffee everywhere but not a drop to drink… Now really, all I wanted was a cup of coffee. 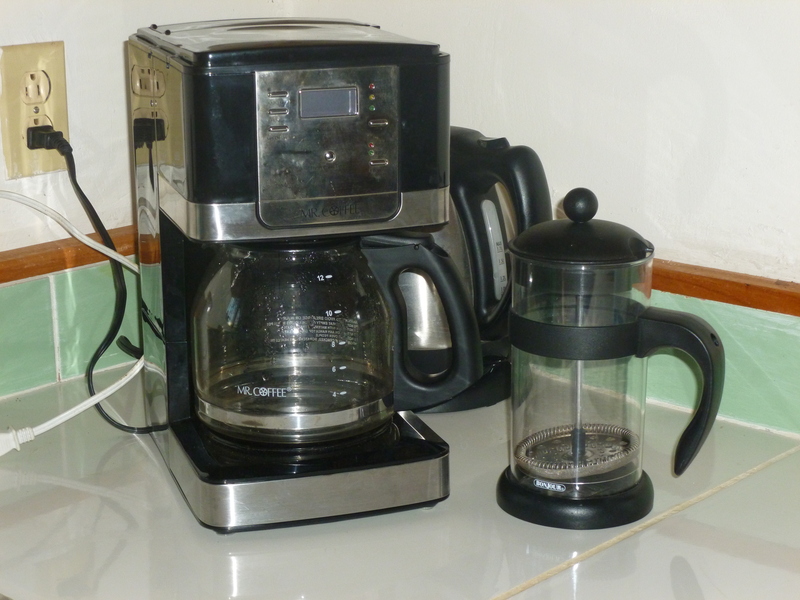 I had the beans and I had the coffee grinder, but no coffee maker. Let me back-up to the beginning of the story. When I came to Liberia this time I knew that I was going to have to move from house #2 to a duplex on campus. No big deal, but I told them I needed a coffee maker. I had an old trusted white one in house #2 that looked terrible but made pretty good coffee. I knew that coffee makers could be scarce, but I had no room to bring one over with me. 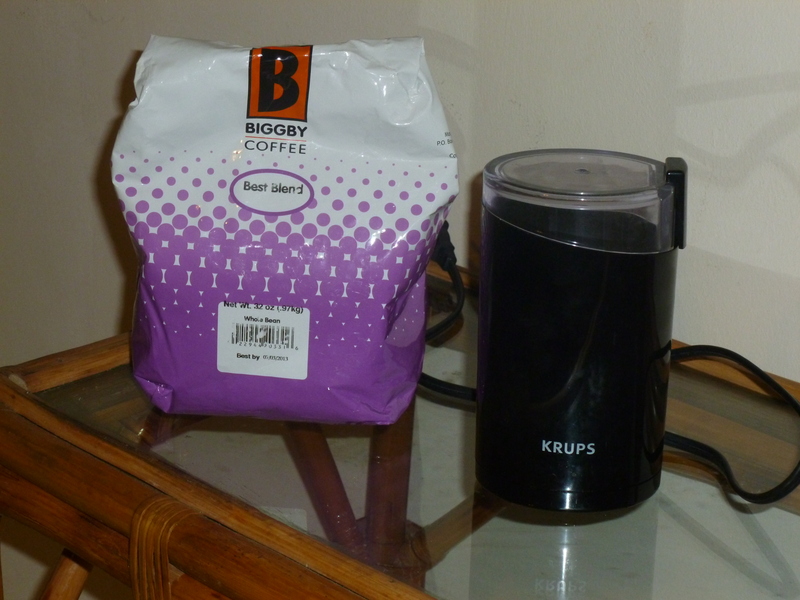 However, I was all prepared for an emergence, because I had a small French press coffee pot stashed away in my belongings at ABCU. Ahhh, I walked in to the duplex and there set a brand new coffee maker. It had been three days of traveling since I had a decent cup of coffee (yes, I am a coffee snob, all I need is a cup or so, but I want it to be a good cup of coffee). The next morning I ground my coffee beans, poured in the water and went to get dressed while the coffee was brewing. A few minutes later I walked back to the kitchen to get a cup, the only problem there was no coffee – the coffee maker didn’t work. Oh well I thought, I will go dig out my French press, but it was missing!!! Later on that morning I talked to the lady who takes care of housing, and she said no one was using the coffee maker in house #1. We walked over to get it, but it didn’t work either. Next, she told me I could take the one in the conference room to use. I hastily went over to the conference room to retrieve the coffee maker and carried it back to my duplex in the drizzling rain. I immediately plugged it in to make sure that it would work and to my dismay it also was broken. By this time I was about in tears and whining big time. I thought is it too much to ask for a cup of coffee? After all I had carried my coffee beans and grinder clear across the ocean, it seemed to me that I should be able to have a cup of coffee without all of this hassle. The next day, I went to two other houses seeing if anyone had an extra coffee maker. Everyone said no and they weren’t about to give up their coffee makers, because they know how hard it is to obtain these items. Then one of my friends on campus told me his sister had given him a coffee cup that actually had a French press built inside of it. He gave me his French press pot and used his special cup. Finally, life had been restored to normal. I know the answer to that question. It is not so bad that I wanted a cup of coffee and was disappointed that I didn’t have one. But, my attitude and what I thought was important was definitely a problem, and the whining and sniveling about not having coffee was not exactly my most attractive moment. Today, as I was reading my bible, I turned to Lamentations 3: 22-24, which speaks to God’s mercies in our lives and his faithfulness. I knew that Jeremiah had written this book as he lamented over the destruction of Jerusalem. I wanted to read a bit more about the writing of Lamentations so I picked up The Soul Care Bible, which has an overview at the beginning of each book. I immediately paused as I read the opening sentences of the overview. It stated, “What causes us to weep, to cry, to shed great tears of sadness? We do well to pay attention whenever we find out eyes filling with tears, for those emotional moments reveal much about what we value, what’s important to us. Well, I can’t say that I shed great tears of sadness over not having a coffee maker, but I did spend a lot of emotional and physical energy on trying to find one. As I read the overview I asked myself, “How much emotional and physical energy did I expend the last couple of days over a lost soul or the needs of the people around me? If someone had been following me around what would they have said that I valued most in life?” How sad, they probably would have reported that it was a cup of coffee. Once again, God has reminded me that as I live in this fallen world that my attitude and values often help contribute to the problems instead of helping to resolve them. 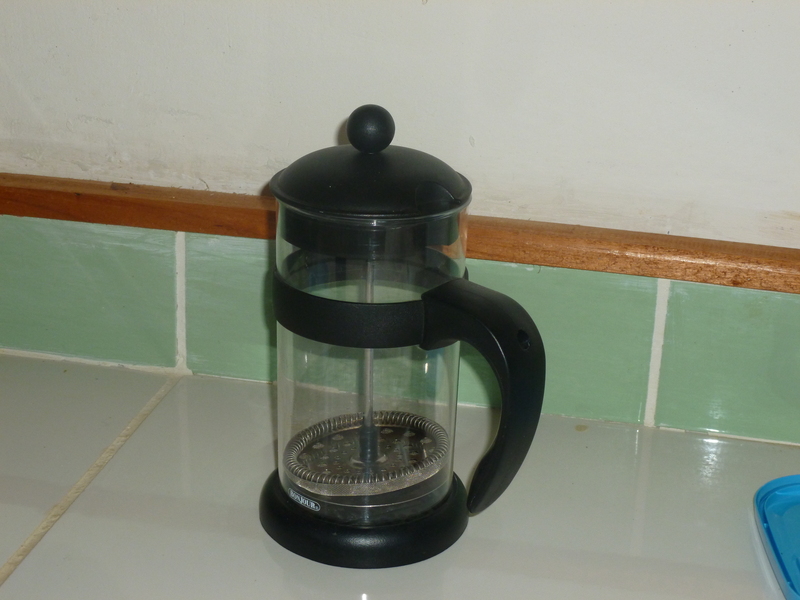 As I word process this blog, I want you to know that I now have both my French press, my husband had loaned it to someone, and a repaired coffee maker. I also am working on my attitude and what I value as important. However, I must admit I am enjoying my coffee. From your perspective what is a hardship? Does the definition of true hardship vary from person to person? True hardship is when our basic needs are not met…for food, shelter, medical care, love, safety. Unfortunately, like you experienced, we misjudge what our basic needs are & wind up considering inconveniences as hardships. Thank you Father for opening our eyes to the truth. Pam thanks for responding about true hardship. I have been contemplating this a lot, especially as I watch the students get sick and have limited resources to help them. Thanks Vicki for your insightful and humorous account. It was honest and thought provoking. 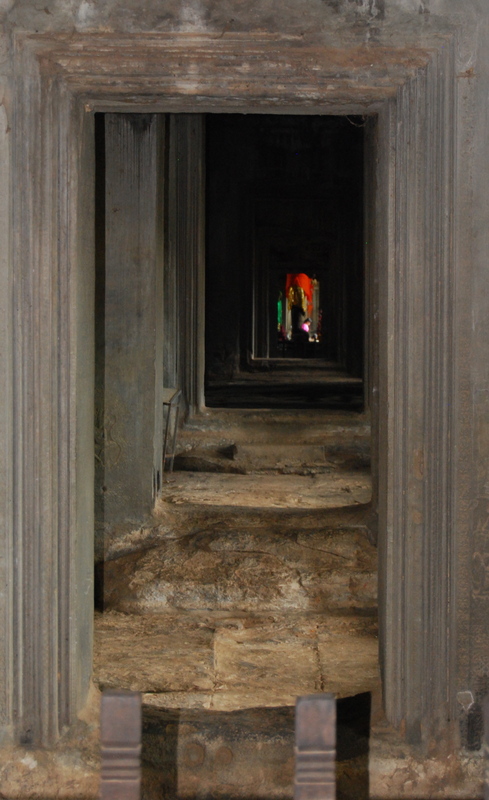 Thanks for following God to a context where you see the disparity more clearly. Thanks for reminding us about jobless graduates and frustrated new fathers who have so little. I would define a hardship as a privation of necessities, persecution or calamity that causes substantial frustration and/or requires special endurance to overcome. 24 Five times I received at the hands of the Jews the forty lashes less one. 25 Three times I was beaten with rods. Once I was stoned. Three times I was shipwrecked; a night and a day I was adrift at sea; 26 on frequent journeys, in danger from rivers, danger from robbers, danger from my own people, danger from Gentiles, danger in the city, danger in the wilderness, danger at sea, danger from false brothers; 27 in toil and hardship, through many a sleepless night, in hunger and thirst, often without food, in cold and exposure. Thanks for responding Tim. God’s scripture sure has a way of convicting a person of their shallow behaviors.